Fortitude newcomer Dennis Quaid has starred in a promotional video for the Fortitude tourist board… but everything isn’t exactly as it seems. 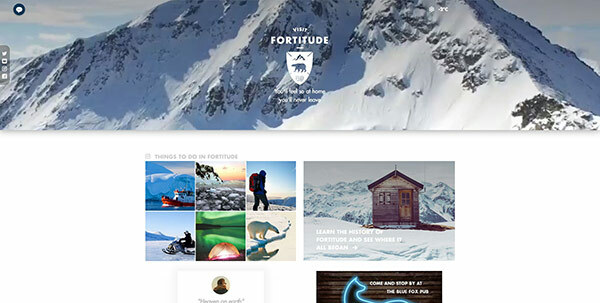 And with an introduction like that, who wouldn’t visit VisitFortitude.com for details on how to book an adventure in a real-life winter wonderland? If you do check out the site, you might even receive a startling surprise. The teaser also sneakily reveals the return date for Fortitude series two. The series will return on Thursday, January 26. 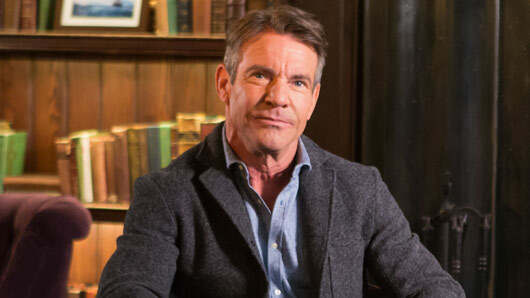 Dennis Quaid join the cast of Fortitude for series two, alongside Game of Thrones’ Michelle Fairley and Misfits’ Robert Sheehan. Series one survivors Sofie Gråbøl and Richard Dormer will return to reprise their roles as Governor Hildur Odegard and Sheriff Dan Andersen. Fortitude returns to Sky Atlantic on Thursday, January 26. A first look at Dennis Quaid and Michelle Fairley in Fortitude series 2 has been released. Quaid and Fairley are set to make their debut in the new series of the gripping Arctic thriller as mysterious married couple Michael and Freya Lennox. Now, to celebrate the launch of NOW TV Combo, we’ve got the first glimpse of the pair in character. In brand new footage, Michael discovers Freya collapsed in the snow and tries to convince her to seek help for a mysterious ailment. Freya, however, refuses – confessing she will not be able to return to Fortitude if the authorities discover how sick she is. Series two of Fortitude will pick up shortly after series one left off in 2015 and deals with the fall out caused by its thrilling conclusion. Until another murder hits the community. After the first series killed most of its lead characters, series two introduces Quaid and Fairley alongside Parminder Nagra (The Blacklist), Ken Stott (The Missing), and Robert Sheehan (Misfits). Series one veterans Sofie Gråbøl and Richard Dormer will also return. Watch the new clip here. Fortitude returns to Sky Atlantic in January 2017. The first trailer for the second season of Fortitude has been released online ahead of its television premiere tonight. Set to air during the season finale of Game of Thrones, the trailer offers the first glimpse at what fans can expect from the new series of Fortitude early next year. It’s the first time we’ve seen new cast member Dennis Quaid in character as Michael Lennox, alongside series one star Sofie Gråbøl as Governor Odegard. The trailer begins with the far-too-quiet Arctic landscape of Fortitude, before panning to Lennox alone in a snow-covered car. Governor Odegard is then shown anxiously searching for something using a flashlight. There is a moment to admire to snow-covered beauty of Fortitude, complete with Björk’s ‘It’s oh so quiet’ playing softly in the background, before the trailer takes a chilling turn and thrills come in like a blizzard. There are new threats, new characters and new bodies to bury.